Different methods for knowing when you need to change the chain, cassette and chainring on your bike. 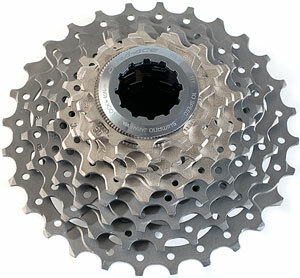 Protect power transfer of drivetrain – lose less power to stretched chains and bigger gaps in cassette teeth. 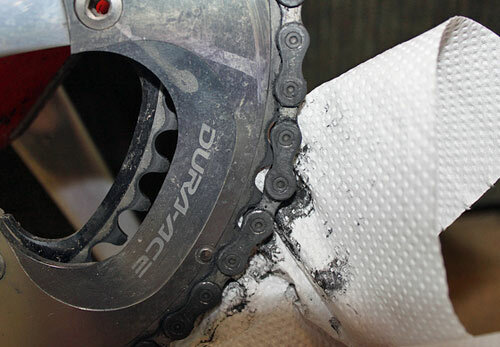 How to check whether chain needs changing. A simple test is to use your finger and try to lift the chain away from the chainring. If the chain can be pushed quite a bit away from the chainring (like above), this is a sign that the chain needs changing. Put a tape measure a the centre of a chain pin. At 12 inches, a new chain will be exactly at the centre of a pin. If the centre of that pin is 1/8 past the 12inches, the chain needs changing. If the centre of the rivet is less than 1/16? past the mark, your chain is ok. If it’s between 1/16? and 1/8? past the mark you’ll likely need a new chain, but your cassette should be ok. If it’s more than 1/8? past the mark, you’ll probably have to replace both the chain and cassette. Note: I would prefer to replace with a cheaper chain (e.g. Ultegra) frequently – than replace with Dura Ace infrequently. Also when replacing the block I tend to go for Shimano Ultegra. The price is about 50% of Dura Ace and only a slight difference in performance. I try to keep a record of when you change a chain and note the mileage. This will give you a guide to when you need to change the chain. Sometimes, I just change it after one month’s worth of riding. This is my chain on my commuting bike. Despite frequent spraying, it has rust. I’m trying to make it last until the end of the icey season. With my commuting bike, I usually wait until the chain starts to slip and then change the chain, cassette block (and sometimes front chainring all together). It means that it can be 12 months between changing the chain. Towards the end of the chain cycle, it is probably becoming inefficient. But, the hassle of changing it is greater than the decrease in inefficiency. However, if it starts slipping off, it is definitely a sign it needs to be changed. After leaving it for a long time, when I do change the chain and cassette on my commuting bike – you can really notice the difference. 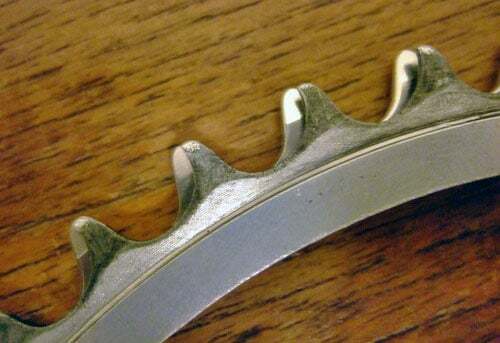 Take a new chain and put it in the largest front chainring (e.g the 50 or 52 tooth outer chain ring. Then put it on the largest cassette sprocket at the back, nearest wheel. This will be a 25 or 27 tooth sprocket. Don’t put chain through rear derailleur at this point. Pull the chain tight and see where it meets; to this then add an extra two links. 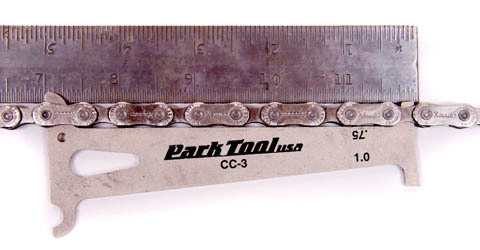 This chain length including the two links is the ideal size of a chain. When threaded through the rear derailleur, the chain should be workable in all the gear combinations that you are likely to use. The chain should be tight, without putting too much pressure on the rear derailleur. If the rear derailleur is pulled so it is almost vertical pointing down, this is a sign the chain is too short. With this chain length, if you had to shorten chain on a ride (because it snapped) you could ride on it. But, you would have to be more careful when using big chain ring and make sure you didn’t use combination of big chainring and low cassette.Once you have the correct chain length, you can just use that chain length to copy any new chain you put on. A worn cassette, teeth have become a bit pointed. If you put a new chain on this cassette. The chain would slip. If a cassette is ‘mid worn’ sometimes there is a mild slip, but after a 50 miles, the chain beds down and you can get another chain’s worth out of the cassette. It depends whether you want the hassle of a slipping chain for a short while. The worn chainring is on the top. The teeth look like Shark fins. They are more pointed. The new chain rings is behind and the teeth are more rounded. Chain rings generally survive longer than cassettes. Even if you need to change chain and rear cassette, it may be fine to keep your existing chain-rings. 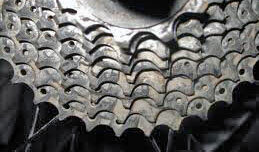 To test whether you need to change your chain ring, it is the same as for cassette. Is there slippage when riding? Do the teeth look more like hooks, with bigger gaps? 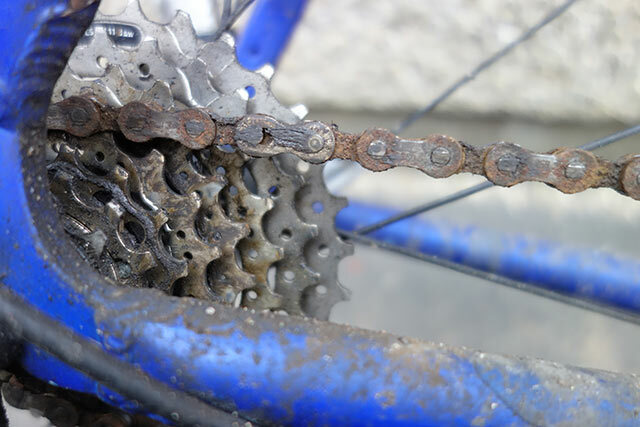 It is not always easy to know whether chain rings and cassettes need changing. I often end up looking at different bikes and trying to compare the shape of the cassette teeth. There isn’t an easy scientific test. It’s also more difficult because even if it doesn’t slip, I still don’t want to be losing power on my racing bikes. Personally, I often find it difficult to spot a mildly worn cassette. I’ve often spent quite a while looking at cassettes trying to work out if they are worn / partially worn or not. I have about 3-4 cassettes lying around my garage in a state of partial wear. Not being used, but not being thrown away…. 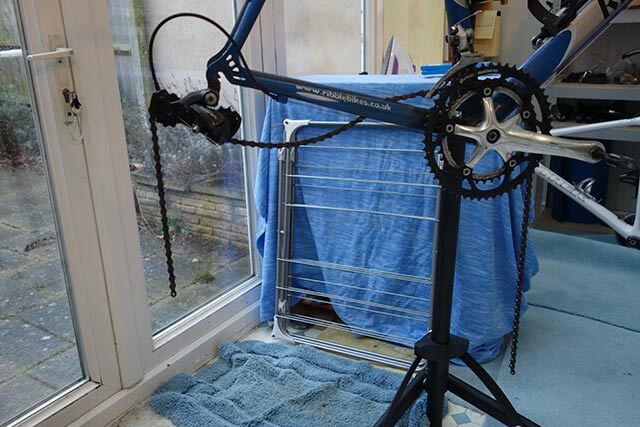 Changing regularly will help prolong life of your cassettes and chain-rings. It is better to buy several cheaper chains then try make your Dura Ace chain last a long time. Have a look at shape of teeth. When they start to become like hooks, they will need changing. Chainrings need changing less frequently. Also, the more teeth they have the less they will get worn. THerefore an inner 36 ring is more likely to need changing than an outer 53. If you ride with worn chain rings and cassettes, you will lose power transfer and could even start slipping on the pedals. 3 Responses to How often to change the chain / cassette on a bike? Think I’ll try the finger test. That looks like the quickest and easiest way.